Cinque Terre is one of those places that in reality, looks like a postcard. The colorful houses, brilliantly mesmerizing aqua water, and intoxicating food aromas make it hard to trust your senses. How is this real life??? Cinque Terre is located on the coast of the Italian Riviera, in the Liguria region of Italy. Cinque Terre, or “Five Lands”, is comprised of Monterosso Al Mare, Vernazza, Corniglia, Manarola, and Riomaggiore. You can easily go from one village to the other by boat, train, or foot following a trail (walking will take 5-6 hours). Visiting the five villages could be easily done in one day but plan ahead so time is on your side. 😉 I did not see any storage facility in this area so it’s best to leave luggage at your overnight destination. I saw two girls half my size pulling a suitcase 3/4 their size and weight, uphill, in 105°, all while trying to figure out directions. That did NOT look fun. If you’re going to be traveling by train between villages, get the day ticket for unlimited rides. Also, get the train schedule so you can plan your transfers more efficiently. I took the train from Genoa to Monterosso Al Mare; the first village on the North side of Cinque Terre. The view of the Coast was incredible! Indeed the perfect teaser for what I was about to experience. As I made my way out of the station, I came across such an alluring view of the beach. Hundreds of colorful umbrellas adorning the sands, clear blue water ready to dive into, fresh salty beach scents, and not a single cloud in sight. It was love at first “wow” (I didn’t even mind the crowd). I couldn’t wait to dip my feet in the Mediterranean Sea. I picked one of the chairs in front of the shoreline (10€ each) and wasted no time! If you do not wish to pay 10€ for a chair, there are other public areas where you can lay without being shooed off. Monterosso has the best beach but is not the only beach; Manarola has a great swimming area. Walked on burning hot pebbles but was instantly refreshed by the soothing aqua wonder. Just as hot met cold, an epiphany dawned on me: I felt bliss, the simple yet perfect state of happiness. There was such a unique vibe nurturing my senses that I instantly enjoyed the moment without a care in the world.After a couple of hours sunbathing trying to score a golden glow, it was time to savor world-renowned focaccia…and I’m talking about focaccia al pesto! I was determined to eat as much as possible to abate the cravings and become overly satisfied so I wouldn’t want any more. Let’s just say that psych move didn’t work out because as I’m writing this, I want focaccia! 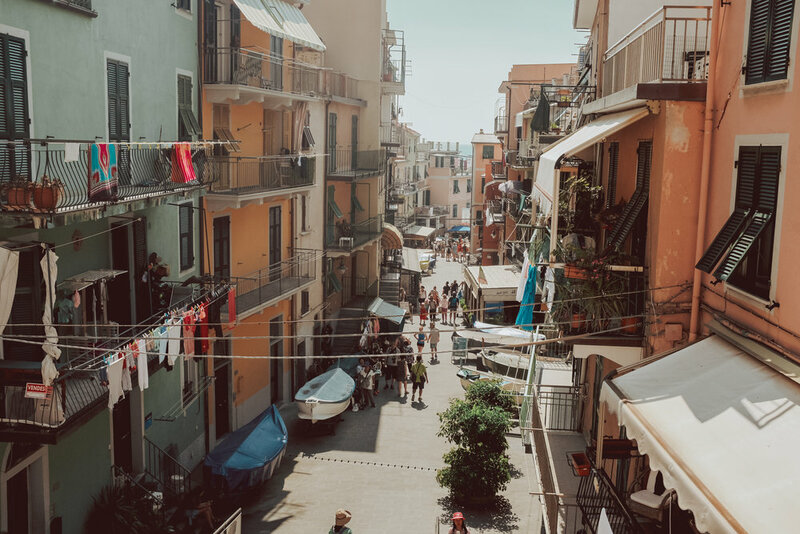 Next stop: postcard town meets life in the center of Vernazza. Explore the Belforte Tower for a magnificent view of this enchanting destination. 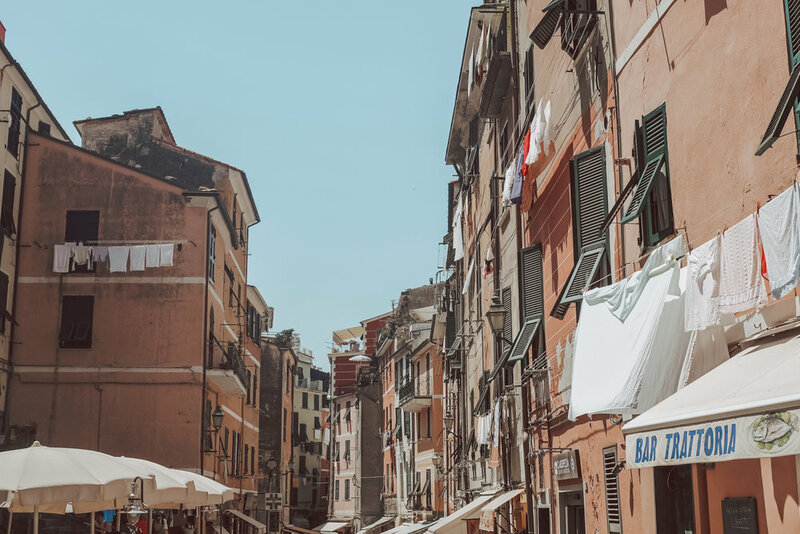 Even though Cinque Terre is a very touristy area, the fact that most of the shops and restaurants are owned and managed by locals has helped maintain the authentic ambiance in the villages. 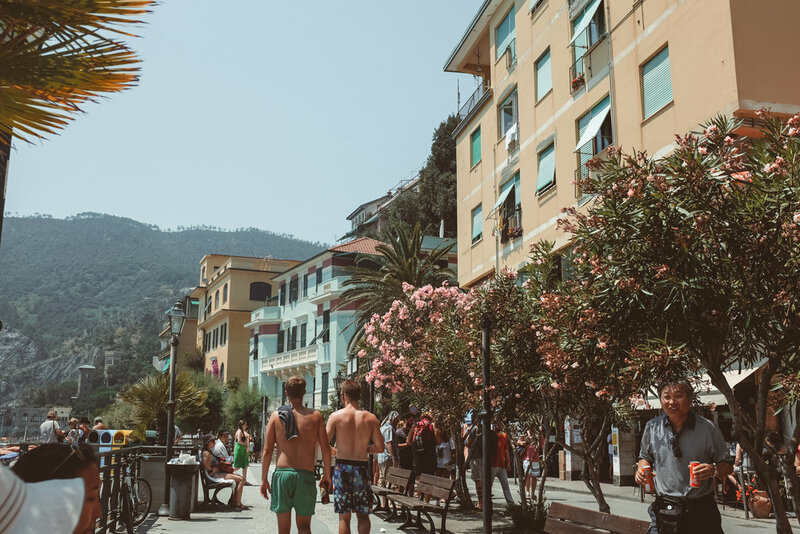 If you want to stay in Cinque Terre for a few days but want to avoid the crowd, try staying in smaller towns on the outskirts and boost your budget-friendly efforts.